Living, as I have for the last few years, high on a mountainside in North Wales, I recently sold my rear-wheel-drive saloon and replaced it with a 4x4 compact SUV so that I wouldn't be stranded every time it snowed. However, my neighbours insisted that good winter tyres were more important to mobility and safety over the colder months, than four-wheel-drive alone. Thus began my quest to determine the best and most cost-effective way to go about running two sets of tyres each year. Having bitten the bullet and splashed out on winter wheels and tyres, I can report that the difference in traction is staggeringly obvious the first time you venture out in the rain on greasy roads. I still tighten up my grip on the wheel every time I see standing water in the road, ready for the inevitable aquaplaning, but I don't need to anymore as my winter tyres just cut through the water without a moment's loss of grip. And as for snow and ice, well, these are just no longer an issue. I took a single-track mountain pass across the top of LLantysilio Mountain yesterday, in three inches (average) of snow that had drifted in the mountain-top winds. Granted, I have a good four-wheel-drive hatchback, but the tyres just pushed on with barely a slip through virgin snow and slush alike, up and down gradients steeper than 20° (40%). I cannot emphasise enough just how good winter tyres are in the rain, snow and ice. They are literally life-savers. Winter tyres cost a little more than summer tyres (about 10% on average, like-for-like), but when you are wearing these down on the road, you are not using your summer tyres. So, apart from finding the up-front funds, the year-to-year cost of running two sets of tyres is unlikely to be very different to running one set, plus you should be able to get something back for the remaining tread on the winter tyres when you sell the vehicle. Which winter tyres should I buy? The ideal winter tyre design is a compromise of grip in the wet, snow and ice, road-noise, longevity/wear and fuel economy. I researched dozens of reviews and articles during Autumn 2014, and one particular winter tyre was consistently cited for its all-round excellent balance of the various properties mentioned. That tyre was the ContiWinterContact TS 830 P, so when my car dealer explained that they only supplied that particular tyre for my car (if I wanted to buy from them), I was delighted. I followed my car dealer's recommendation of fitting slightly thinner tyres with a larger profile on smaller rims, and have noticed no loss of handling during hard cornering, just a slight increase in road noise and comfort. Apparently the thinner tyres cut through standing water and snow better than thicker ones, and the taller profile sidewalls offer greater protection to the rims and suspension when one hits those pesky potholes that hide beneath innocent looking puddles and snow drifts. I did, of course, stay within the manufacturer's recommended range of rim and tyre combinations for my particular car model, as vehicle dynamics is far too complicated a subject these days to want to take any chances. Should I buy winter wheels (rims) as well as tyres? This was another issue that involved a lot of research. Basically, you have two options: (1) buy a second set of rims, or (2) change the tyres on your standard rims twice a year. Paying someone to change the tyres is the easiest way to go, but is it the most cost-effective? Let's look at the sums. Kwik-Fit charge £13 per wheel (including valves and balancing) to swap your tyres, which is £104 per year for a set of four. They will also store the tyres you are not using, for £18.50 per tyre per season, which is £148 per year. So, if you keep your car for five years, you will have spent £1,260 plus the cost of the tyres. You will not be able to fit thinner or higher profile tyres, because to do so requires different sized rims. Also, your lovely summer alloys will have to endure the harsh rigours of the UK roads in the winter. Alternatively, you could buy a set of rims sized to match whatever specification of tyre you feel is best for the winter. If you don't much care for how they look, steel rims can be bought new for as little as £55 each, depending on size. Alternatively, alloy wheels cost about £200 each for a half-decent design. I bought smart, German, 17" alloy wheels with fitted ContiWinterContact tyres, balanced, with wireless pressure sensors fitted, from my car dealer for £1,300 including VAT, which is £325 per wheel and tyre, or £200 per rim - not bad! To make it easier to change the wheels twice a year, and after more exhaustive research, I bought a very highly regarded Clarke CTJ2250LP trolly-jack, and an equally well reviewed Clarke CHT141 torque wrench from Machine Mart for just £72 the pair, which is everything one needs as the jack comes with sockets and a handle that can be used as a wrench. This makes jacking the car up so much easier than using the emergency jack that comes with some cars. I already had a set of axle stands, which are essential if you want to be safe while changing wheels. A good set can be bought for as little as £20. So, that's £872 for four nice alloy rims and the tools to change the wheels over, which is £388 cheaper than asking Kwik-Fit to change and store your tyres over a five-year period. Also, if yours is a modern car with no spare wheel, having four spare wheels and tyres ready to go at all times means that if you wake to a flat tyre one morning, you have a spare ready to use while you get the other one fixed. It also means that if you're planning a journey with a high risk of tyre damage, you can always carry a spare in the boot for the duration. You can save money with Option 2 by only asking Kwik-Fit to change your tyres (at a cost of £520 over five years, plus the cost of the tyres) then store them yourself, or with Option 1 you could buy cheap steel wheels and budget tyres (probably for about £520 all-in), and use an emergency jack and brace. You don't have to spend £1,372 as I did, but that seemed like an excellent deal to me, plus my car looks good all year round, and I will be as safe as I can be with the best size and brand of tyres. 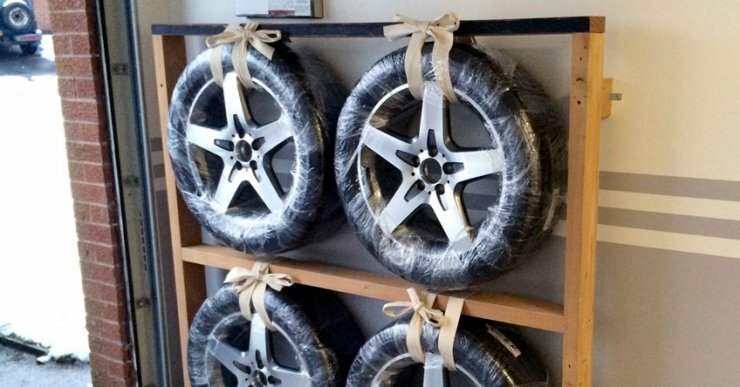 How to store winter/summer wheels and tyres when space is tight. Ideally, wheels with fitted tyres should be stored suspended from the rims so that the tyres do not become misshapen. They should be kept in the dark as sunlight speeds up the tyre's natural degradation process, and they should be kept in air-tight containers to slow down the evaporation of oils in the rubber compound. These are the generally accepted rules of how to store car tyres and wheels, and you can buy special bags for the purpose if you have room to stack your wheels, which I don't! I have a very small garage that affords me just an inch of space each side of my door mirrors as I reverse in. If I don't drive in at an angle, I can't even open the door to get in and out the car. Space is at a premium but I do have a narrow corridor of room alongside the driver's side front wing when the car is in the garage, which is enough to fit all four wheels on a rack as shown above. I built it out of 2" x 4" timber and some very large screws, and have secured it to the garage wall in four places. I suspend the wheels with standard cloth webbing, leaving just an inch of space underneath, which is all that's needed. The garage is dark for all but five minutes a day, so I don't need black tyre bags, and I use clingfilm to keep the tyres reasonably airtight. Each wheel takes about 10m of clingfilm to cover. Clean the wheels and tyres with standard car shampoo, and thoroughly dry them. Before you wrap them up, check the tyres for damage and mark where each wheel came from on the car so that you can replace them front-to-back to even out the wear (always keep the same direction of rotation to avoid counter-stressing the tyre compound).